Gambhir was adjudged caught behind off Dale Steyn when the ball clearly missed the edge by good two inches. "I would not have reacted that way had I nicked it. It just happened in the heat of the moment as it was a big game for us," skipper Gambhir said, not hiding what he felt about the decision by the English umpire. Gambhir gave a lot of credit to the bowlers for restricting the Sunrisers for 142 as he was expecting to chase 160-odd. "I want to give credit to the bowlers for their performance on such a wicket. Looking at the wicket, playing three spinners, we were looking at chasing 160-odd. The three spinners bowled brilliantly to restrict them." Rival skipper Darren Sammy admitted that his boys didn't bat well at the death. 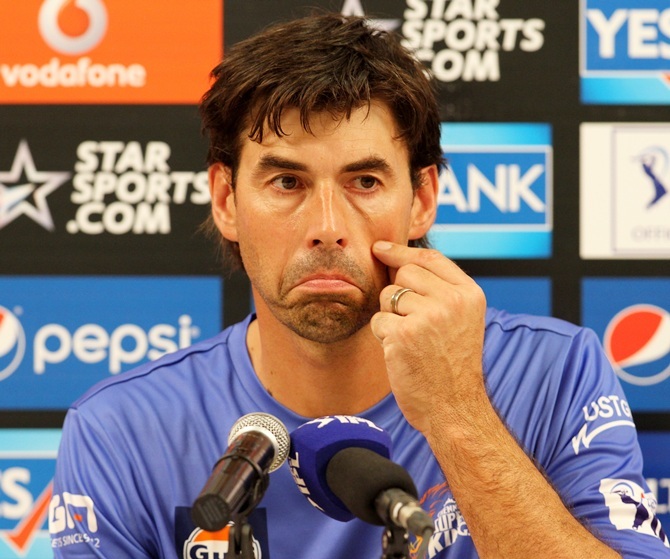 Chennai Super Kings batsman Stephen Fleming has attributed his team's defeat against Royal Challengers Bangalore to a slow pitch in their IPL-7 tie played at the JSCA Stadium in Ranchi. Chasing 139 for a win, RCB defeated CSK by five wickets. "One of the main reasons for the defeat was difficult batting (conditions) on a slow pitch," Fleming said. Though the match was low scoring, yet the team expected to win, he added. The former New Zealand captain lauded teammate Suresh Raina for his spectacular innings of 62 runs off 48 balls in the match.